We've noticed that many people build customized maps using My Maps and KML to help others see the planet in a new light. We've seen everything from maps of hiking trails with pictures taken along the way to a guide to the world's mountain peaks. Today we're releasing Terrain maps to help highlight this natural beauty even more. These maps focus on physical features such as mountains, valleys, and vegetation. They contain labels for even very small mountains and trails and are enhanced with subtle shading that can often give a better sense of elevation changes than a satellite image alone. For example, we think Terrain maps may just be the best way to experience the grandeur of the Grand Canyon or to plan your hiking trip on the Appalachian Trail. And of course, big mountains look really cool. Better yet, you can mix them with custom maps from our users, such as a map of highest points in the United States or a guide to the Pyrenees mountains. 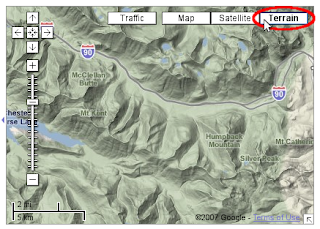 To see the new style, simply click on the "Terrain" button in the upper-right corner of the map.